A very beautiful wine that it Hautes Côtes de Beaune "En bois Guillemain Blanc" 2015 of the Domaine Jean Chartron, very modern by its elegant approach. Beautiful length carried by vanilla notes and of almond. A wine of very seductive charm. The Hautes Côtes de Beaune En Bois Guillemain White wine of Jean Chartron vineyard is perfect with grilled fish, snails, white meat or with weined cheese. Domaine Jean Chartron, based in 1859 by Jean-Edouard Dupard, saw crossing 5 generations quite worried about the prosperity of the vineyard. 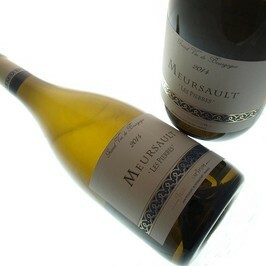 In 1873, Jean-Edouard Dupard managed to add the name of Montrachet, his most prestigious vineyard, to that of Puligny. It is the Chartron family, today, that exploits the Burgundian domain. With only 2 vines, the Pinot and the Chardonnay, the region is par excellence the one of the expression of the country. Jean Chartron's wines are renamed in particular to their Premier and Grand Cru with naming quite so recognized.